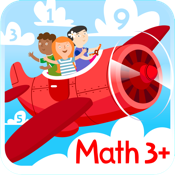 This captivating math multiplayer game app is an amazing educational and social time for kids and their parents. It is a great game to build skills of counting and addition from 1 to 10. Playing with a kid the parent can assess his/her level of math skills. From 1 to 4 children of different ages can play the game. It is ideal for communication skill development. After a fun math contest, the winner will be offered a movement break. This should help a little one to shift attention from the mental activity. - competition motivates children to build counting and addition skills faster. Fun math application for kids and their parents.